Newspaper Rock: Mauch Chunk became "Jim Thorpe"
Is There Life After Jim Thorpe for Jim Thorpe, Pa.? By James R. HagertyIn 1953, two adjoining Pennsylvania towns on the edge of the Pocono Mountains—Mauch Chunk and East Mauch Chunk—were desperate to attract business. They made a bet on the corpse of Jim Thorpe, a Native American athlete from Oklahoma who was the star of the 1912 Olympics and later a professional football player. The towns made a deal with Mr. Thorpe's widow, Patricia. She would allow his body to be buried here. They would build a "suitable memorial" on the burial site. The two towns also agreed to merge into one community named Jim Thorpe. The name of Mauch Chunk, or "bear mountain" in the Lenape Native American language, was retired. Today, 57 years later, the bones of contention are still rattling in this town of about 4,900 people, 80 miles northwest of Philadelphia. Last month, one of Mr. Thorpe's sons, Jack Thorpe, filed a lawsuit in federal district court in Scranton, Pa., seeking to force the town to surrender the body so it can be buried with other family members near Shawnee, Okla. The town of Jim Thorpe still hasn't decided how to respond, a spokesman says. "We just want to bring him home and put him to rest where he wanted to be," says Jack Thorpe. He has no grudge against the town: "They've always treated us well." The Chunkers, as locals here are sometimes known, honor the late athlete even though he had no connection to the area and probably never even visited.Comment: The interesting thing to me is how they took one Indian term--Mauch Chunk or "bear mountain"--and replaced it with another. The second term had nothing to do with the region; it was simply a marketing ploy. Euro-Americans have come up with weak reasons for changing Indian place names, but this one is among the weakest. How about embracing the location's Lenape Indian heritage instead? Create a memorial or start a festival to them, not to an Indian from across the nation. And don't cry over the loss of Thorpe's remains when your motives were so transparently commercial. For more on Jim Thorpe the town, see Jim Thorpe, Pennsylvania. For more on Jim Thorpe the athlete, see Three Native Olympic Gold Medalists and Native Signs on Santa Barbara Buses. 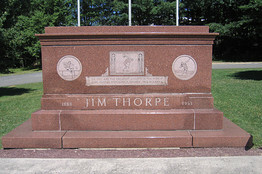 Below: "Jim Thorpe's burial site in Jim Thorpe, Pa."